You are not losing money if you buy a premium bond, you are earning whatever the yield on the bond is when you purchase it. If you were losing money, the yield would be negative. The bond market continues to respond to day-to-day economic reports, seemingly pushing interest rates up one day and pulling them back down the next. From a global perspective, significant divergence exists between U.S. sovereign rates and other nations’ rates. Over the last couple of years, the anticipation has been the European and Asian markets’ GDPs would recover, a slow down or elimination of quantitative easing would ensue (general global accommodative monetary policy) and global interest disparity would dissipate. The predictions have not held up and in many of the nation-to-nation comparisons, interest rate disparity has actually widened. I have long reasoned that as the world’s central banks continue to pump money into the markets through quantitative easing, they create a momentous headwind to higher interest rates. There hasn’t been enough positive news in Europe and Asia to push productivity and change their monetary policy. Accordingly, instead of the moderate growth pace of the U.S. pushing general interest rates up, the world economies may be aiding in pulling them down especially now that the Fed has seemingly decided to discontinue their slow short term interest rate hikes. In a flat or falling interest rate environment, individual bonds play an even more important role, perhaps best summed up as: investing for return of principal, not return on principal. The temptation is to continue to reach for yield or double down in poor substitute products yet prudent investment discipline is essential especially when the yield curve is forewarning of possibly still lower interest rates. Individual bonds afford a protection in this environment that mandates a disciplined allocation. Maintaining some bond duration affords investors better overall protection and income compensation for portfolios heavily saturated with growth assets as higher duration bonds are negatively correlated with equity volatility. Although the Treasury curve remains flat, the corporate and municipal markets have maintained positive slope. The year-to-date bond market rally has created opportunity to extend duration and possibly “clean up” credits that have deteriorated. Stay disciplined, stay appropriately allocated with individual bonds and maintain long term strategy. The bond market is showing some volatility, only not necessarily in the direction anticipated by many experts and investors. Perhaps the great bull bond market is not quite ready to surrender. 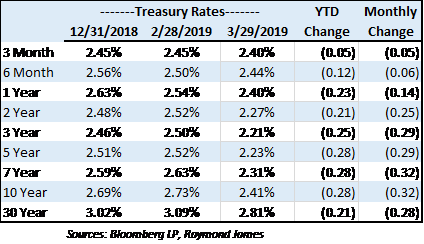 The month of March saw a significant Treasury rally, pushing yields down across the curve by as many as 32bp. There are many factors affecting the market, not the least of them of course is the Fed which could be argued as the entity choreographing how these markets have unfolded for some time now. The Fed’s reversal on their tightening policy and path to “normalize” interest rates, weak European data and waning corporate earnings continue pushing and pulling nervous investors to and from safe haven assets. As it stands, US securities may represent the best on both fronts. There remains a wide divide in sovereign debt yields. Before brushing off the old cliché that “this time is different”, recognize that conditions have been different for some time now. The big “miss” may be in Europe’s ability to right the ship. It has long been assumed that global interest rate disparity would diminish as economic conditions improved pushing European interest rates higher. It is beginning to look as if US rates may continue dropping more toward inferior global interest rates. Weak conditions and political strife around the globe continue to impede progress and create continued demand for more attractive US rates. This demand is a headwind to higher US rates. Germany, Switzerland and Japan all have negative 10 year yields. According to the Bloomberg Barclays Global Aggregate Negative Yield Debt Index, there is now over $10.3 trillion dollars, or 20% of the world’s investment grade sovereign debt offering negative yields. Global central bank intervention continues to expand ballooning central bank balance sheets. Quantitative Easing (QE) was originally established as an emergency measure but has recently been described as a routine tool (along with QT/Quantitative Tightening) for the Fed to control money supply. The month of March also introduced a glimpse at an inverted 3-month Bill to 10-year Treasury. The curve flirting with inversion garners much attention as inverted curves have been the prelude to the last 4 recessions. There are notable differences to consider but not necessarily suggesting the market ultimately ends up with a different fate. First, the Fed has never carried this large of a balance sheet (peaking at $4.5 trillion, now ~$4 trillion). While building the balance sheet the Fed maintained a Zero Interest Rate Policy (ZIRP) for over 7 years. Upon examination, when the Fed moved to a tightening policy (raising the Fed Funds rate), it could be argued that they were getting ahead of an issue such as inflation. This time, the Fed simply appeared to be moving toward “normalized” rates. Starting to raise from 0.00% certainly feels different than starting from 4.75%, 3.00% or 6.50% (the last 3 starting points historically/not currently when the Fed began hiking rates). The previous 3 inversions occurred within an average of 1.5 years from the Fed raising interest rates. This time, the Fed began raising interest rates in December of 2015, 3.3 years ago. The pace of the Fed hikes has also been stretched out. Also noteworthy is that from the time the curve begins to invert, it has taken 1.5 – 3 years for past recessions to start. If the past is any indication, even when the curve inverts, it lasts about 12 months. Within 2 years of inversion, the slope has gravitated to a slope of 200 bp. However, the past is no guarantee of the future and as pointed out, the yield curve and many of the market conditions are very different. Regardless of the ultimate fate of the curve, the overriding emphasis during these undetermined times is protecting your principal. As interest rates fall, don’t abandon investment discipline. The fixed income allocation is the easy part. Individual bonds ride out the storm. 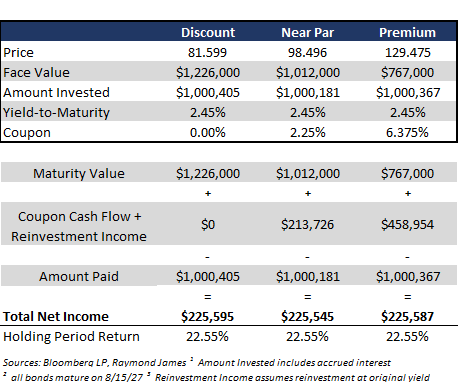 Barring default and when held to maturity, from the day an individual bond is purchased, the cash flow, income and day of redemption do not fluctuate, despite market pricing changes.